Last weekend, the Greece people (or a declining proportion of them) elected a new national government. It was a farce. There was no competing electoral mandates sought. The population know what is in store for them. The policy mandate in force wasn’t even supported by popular vote. It comes from the Troika, which now effectively governs the Colony of Greece. The new Prime Minister, who sold the people out prior to the election, is now talking about making changes. Yeh, right! He is now just a tool for the Troika. National elections where the people do not vote for anything much don’t look like a healthy democracy to anyone who isn’t in denial as to what has been going on. Democracy is about the people being able to change governments that do them harm. In the Eurozone that is an old-fashioned idea. National elections have become a sop, a pretense. And the people knew it and stayed away in droves. The Greek election was a total farce – democracy died. Data from the – Ministry of Interior and Administrative Reconstruction – shows that voter apathy is at an all-time high. 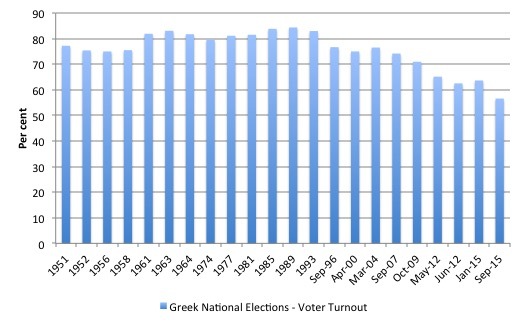 The following graph shows the voter turnout as a percentage of total registered voters. In the January 2015 National Election 63.62 per cent of registrants voted. By September 2015, this proportion had dropped to 56.57 per cent, which can only be interpreted as Greeks giving up on the democratic process. To put that in perspective, in June 2015, 62.5 per cent of the registered voters turned out to vote in the so-called “bailout referendum”, which is the proportion that has been voting at national elections in recent years. The drop in votes between the January and September national elections amounts to some 694,610 people choosing not to vote (relative to the registrations in September). That figure is actually an understatement because registrations fell between January and September 2015 by 109,159 persons. Syriza leader Tsipras is now talking about overturning the oligarchs and gaining debt relief from his Eurozone masters in the North. The first is fanciful given it is the interests of the oligarchs that the Troika is really protecting. The second is largely irrelevant to the immediate plight of Greece a dramatic shortage of spending and income. With low interest rates on the outstanding debt, the issue of debt relief is rather moot. The constraint is the pernicious bailout agreement not the debt interest payments. But his rhetoric is totally unconvincing (at least from the outside). Totally unbelievable. He was humiliated just a few months ago by the political elites in Europe. He accepted a bailout deal that has little hope of delivering any long-term prosperity and was worse than what was on the table before the January election. The lack of electoral support for LAE (Popular Unity), the left-wing breakaway from Syriza – they received 2.9 per cent of the vote and no seats (meaning all their Syriza parliamentarians from the January election are gone – probably demonstrates the fear of exit. Other factors might explain their lack of showing. For example, it is hard to mobilise a new political party in a few weeks. Tsipras is now prepared to oversee the most harsh attack on his nation’s socio-economic infrastructure that you could imagine. I know all the arguments that Greeks are not as badly off as some other non-Eurozone nations (say Bulgaria) and is streets ahead of some of the poorest African nations – “so what are they complaining about”. Or there has been no austerity because government spending is still high sort of arguments! When an argument depends on some ridiculous benchmark for its success you know the game is up. This is a nation that has undergone a deliberate transition in a short space of time that has wiped off more than 25 per cent of its GDP and national income. It is a nation that has an entrenched one quarter or so of its labour force without work. It is a nation that has more than half of its youth (who want to work) without work. Try doing all that with an exchange rate depreciation! Tsipras is now the figurehead, taking orders from the Troika, and making all that even worse. Its crazy stuff but looking in from the outside it shows that the democratic process has been severely compromised. The mandate is set from outside. The Troika technicians overrule the elected officials. The elected officials only have ‘tenure’ as long as they are doing the bidding of the Troika which is made up of unelected, unaccountable and foreign elites. In this context, the debt relief argument is really somewhat secondary in importance. That is not to say that I would keep paying the debt. The best thing for Greece is to leave the Eurozone and redenominate the debt into the new currency. That is superior to defaulting. Then the debt holders have an incentive to keep the new currency as close to parity with the euro as possible. There will be many books written about this period and will focus on why the Greek people continue to vote for governments that overtly and obviously damage their prosperity and in some cases, drive people to suicide. How is it that the Greek people are so wedded to the membership of the Eurozone despite it delivering this sort of poverty and anguish? I am working on that question in one of my current book projects. How is it that the left-wing political parties, like Syriza, can actually openly compete for power when they know they are just going to be operatives of the Troika and introduce policies that are the anathema to their stated policy agendas? These are not just trifling differences in policy emphasis. Syriza is now elected to push through policies that are totally at odds with the mission of the party. The whole process has made a mockery of what democratic politics is. The Eurozone bullies – the Troika – have now totally compromised the political process in Greece – it is nothing more than a colony. There are a lot of hypotheses about why the Greek people have allowed this to happen. It comes down to the powerful hold that the ‘euro’ has on them. More about which another day. But what I learned from my brief visit to Portugal recently was that the ‘left’ (by which I mean those who advocate progressive views on almost everything) are lost when it comes to economic understanding about the alternatives to membership of the Eurozone. They know that Eurozone membership with its accompanying austerity is bad for the nation and especially the poor but have come to believe that life outside the Eurozone would be worse and the nation would be unviable. The same sort of syndrome is operating to condition the attitudes of the Greek voters and I identified it was prevalent among so-called ‘left-wingers’ in Italy when I was there in November 2014. They start with a plea – “what would happen to the currency?” and follow it with “where would the jobs be?”. They have been led to believe that an exit would see the currency depreciate to ridiculously low levels, imparting hyperinflationary pressures and dramatically cutting their real wealth. They haven’t studied history closely. It is quite possible that the currency would not depreciate much in the early stages of the exit. Remember supply and demand. There is no Greek currency at present. The exit situation is quite different to a nation coming off a peg. In the latter case, there is already a substantial supply of the currency in the markets. As soon as the government announced the exit and that all tax liabilities (and other legal payments) had to be made in the new currency, then the demand would soar even if consumers continued to use the euro in daily transactions. They would soon work out that they had to get the new currency or go to prison for tax evasion! So initially, the supply would be short relative to demand. Additionally, as I noted above, if all the outstanding public debt was redenominated into the new currecy, the debt holders would have an incentive to keep the exchange rate as close to unchanged as possible or else take losses on the conversion back into euros. Later on, as the currency became more widely available some realignment with the euro might occur depending on what happened to the external balance. If Greece started to run large currency account deficits then the currency would adjust downwards. But a collapse in the currency (whatever that actually means) is unlikely. I note that Australian dollar is currently at 70.3 cents against the US dollar (as of yesterday). This time two years ago it was at 93 cents and in April 2013 was above parity. Is that a ‘collapse’? Has the sky fallen in on us? The weather has been bad the last few days but the sky is still up there! Similarly, in November 1996 it was at 80 cents and by March 2001 it was at 49 cents. Was that a ‘collapse’? I was around at that time and didn’t notice the sky fall in. I did notice that travel abroad became more expensive as did imported luxury cars. But not a lot of angst! I realise the factors that drive the Australian dollar are probably quite different to those which might drive the value of Greece’s new currency. But cycles in currency values occur and have real effects. But they are not death sentences for the nation – especially one that is well endowed with tourist appeal. But can anyone seriously believe that exchange rate movements that would accompany an exit really wipe of more than 25 per cent of real GDP and national income? Even in ‘value’ terms, if the terms of trade swung so far, prices in Greece relative to the rest of Europe would be so low that the German tourists would be flooding into the place to holiday even if the tourist infrastructure has been degraded somewhat by the years of austerity and underinvestment. In other words, even a worst case scenario on the exchange rate front would probably not go anywhere near eroding national income in the way that membership of the Eurozone has. The second question relates to the decline of manufacturing and industry in general and the reliance on imports for a good proportion of the consumed goods and services. What would Greece produce? Well, lots of things. And a floating exchange rate would generate new opportunities. I have noted before that it exports its world class olives to Germany and Italy for processing into olive oil. If the exchange rate depreciated somewhat, then it would provide incentives to local processors to start up and investment would be attractive in that sector. There are many examples such as that. But Greece still has factories. It still has a world class shipping (construction, maintenance, transport) sector. It still has the sun shining over its beautiful islands. The people still have skills. In the adjustment period, real standards of living measured in imported goods and services might lag domestic growth (as the terms of trade move against Greece – if that happens). But I cannot see that being sustained given the natural assets that the nation has. It is clear though that Greece is just part of the disaster. Some 7 years into the crisis and the Eurozone elites really haven’t come to terms with the fundamental problem nor any viable and timely solutions. The creation of a federal fiscal authority embedded in the European Parliament, which would have resources to deal with asymmetric spending collapses such as the GFC, would solve the dreadful design flaws in the monetary union, as long as the fiscal rules were relaxed so that fiscal policy had sufficient amplitude to operate effectively. But such an authority will never emerge given the cultural differences among nations and their unwillingness to give up what they mistakenly see as their economic policy sovereignty. It is a curious concept of sovereignty. None of them issue their own currency. None of them can float the currency they use. None of them have the capacity to set interest rates. None of them can protect the integrity of their own financial systems (banks etc). And when things get really rough – they lose any semblance of democratic accountability – last weekend in Greece demonstrated that in spades. So the suggest made by Mario Draghi (ECB boss) in his – President’s introductory remarks at the regular ECON hearing – to the Economic and Monetary Affairs Committee of the European Parliament yesterday (September 23, 2015) seems rather fanciful – more grandstanding than commitment. … despite the best efforts of all actors involved, the crisis has shown that monetary union requires a political centre; a centre that can take the relevant fiscal, economic and financial decisions for the euro area as a whole in a swift and transparent manner with full democratic legitimacy and a clear set of responsibilities given to it by the legislators. It is in this spirit that I have called repeatedly for a move from rules-based coordination to sharing of sovereignty within common institutions. He was referring to the proposals outlined in the so-called Five President’s Report – Completing Europe’s Economic and Monetary Union – which was released on June 22, 2015. If Draghi is trying to suggesting that the Report provided a pathway to a full fiscal union for the Eurozone then he is misleading the public and/or deluded. I considered that Report in this blog – The five presidents of the Eurozone remain firmly in denial. As I noted, the “three-stage plan” in the Report doesn’t come to fruition until 2025. The document had all the usual European Union buzzwords – “longer-term vision”, “deepening by doing”, “rule-based cooperation”, “structural convergence”, “commonly agreed benchmarks for convergence” and on and on. It read just like some of the general promotion statements after the Maastricht meetings in 1991. In the – Four President’s Report – released in December 2012, there was a suggestion that “an appropriate fiscal capacity, for the euro area” be investigated, including “common debt issuance”. Nothing happened in that regard and by the time the fifth President (European Parliament head) was added to the cosy little group, lal mention of the possible establishment of a federal fiscal capacity has disappeared. Further, any notion that there might be “common debt issuance” has been deleted with the regime change at the top of the European Commission. Instead, they extolled the virtues of the “‘Six-Pack’, the ‘Two-Pack’ and the Treaty on Stability, Coordination and Governance” (the fiscal compact), which they claim “have brought significant improvements to the framework for fiscal policies in the EMU”. Second, they talked about a “fiscal stabilisation function for the euro area” which might include the creation of an “automatic stabilisation” function “at the euro area level” to cushion large macroeconomic shocks. So this might include an euro-wide unemployment insurance scheme, which would add very little to the capacity of the Eurozone to promote stable growth with full employment. Any such stabilisation function would “not lead to permanent transfers between countries or transfers in one direction only” (sop to Germany). It “should neither undermine the incentives for sound fiscal policy-making at the national level, nor the incentives to address national structural weaknesses”. The idea that the major economic policy decisions should be retained at the national level but be subjected to strict rules imposed by Brussels is as alive today as it was in 1991 when the whole fiasco was agreed upon. There was an interesting article by the German economist Michael Burda yesterday (September 23, 2013) – Dispelling three myths on economics in Germany – which put things into some perspective. I will consider his article in more detail another day but relevant for today’s topic were his remarks about economic policy making in Germany. It is not ordoliberal religion, but a mixture of national self-interest and healthy mistrust informed by experience, that guides German economic policy today. At the core is the fact that Europe still consists of sovereign nations, and most Europeans still want to keep it that way. He also noted that if one of the German states floundered (and he points to Bremen and Saarland as examples) then “While it appears plausible and perhaps unavoidable to bail out Bremen, Saarland (or Berlin), doing the same for ten million Greeks is another question”. So Germany is fine operating as a true federal system and will use the national coffers to ensure no state suffers disproportionately. But it is not prepared to place the nation (Germany) within a federation of Europe. It will never cede their sense of national purpose to a European-level fiscal authority. Nor will any of the other nations. They will allow the Troika to declare one of their own a colony with all the negative implications for citizens in that particular nation if it means their national interest is protected. They will tolerate pernicious policy regimes being imposed on other Member States of the Eurozone which they would not tolerate within their own federation of states. That summarises why it is fanciful to think there will ever be a serious repair of the flawed design of the monetary union. They will bluster for years and tinker around the edges but they will never actually set the system up to function effectively. The next major crisis which is coming soon enough will then knock it for six – again (cricket analogy!). I think Michael Burda’s contribution was a very reasoned account of the constraints facing working economists in Germany who seek to have policy input. I didn’t agree with some of his important conclusions (for example, he eulogises the Hartz process that created the mini-jobs). But he clearly reflects the sentiment that the policy makers in Germany are looking after Germany even though they have entered this weird currency arrangement with a disparate set of other countries, some they share a long and close economic association with and others which the only thing they really shared was the appalling memories of the Second World War occupations. I have written before how German policy makers (and their advisers) clearly understood the implications of surrendering their currency long before the other nations seemed to cotton on. They imposed internal devaluation in 2003 (Hartz labour market changes) to ensure their real exchange rate (international competitive) would remain even though the exchange rate would now be shared. The problem is that these early changes within Germany, that were introduced to advance German interests (of the elites but not the workers) set up destructive dynamics that eventually made the GFC worse. I have dealt with all that before. The suppression of domestic demand (spending) in Germany through real wage restraint and low investment rates, the export of profits as speculative loans to the peripheral Eurozone economies, the property booms and growing external deficits in these nations, and then the collapse. The point is that none of the Eurozone Member States will cede what little policy autonomy they have to the European Parliament. The Greek election was a farce really. Whatever spin one wants to put on it – it was a farce. There were no competitive mandates – alternative policy frameworks, and the people knew that whoever was elected would just turn up to work next day and wait for the phone call from the Troika. The bailout package that Tsipras agreed to requires accelerated and very nasty policy changes to be executed in October. The idea that a left-wing government would oversee that pernicious regime under direction from outsiders (the Troika) renders the democratic process in Greece void. I am visiting Finland between October 7-11, 2015 and will be giving a number of presentations and talks during those four days. 1. Thursday, October 8, 2015 – SOSTE Talk 2015. I am their guest and I will be speaking at their annual conference – SOSTE Talk. The topic will be on Full Employment and how governments can achieve it. I will be speaking between 9:00 and 10:30. After a 90 minute train trip from Helsinki to Tampere I will be speaking at the University of Tampere on the theoretical and political background of Eurozone austerity. There will be two discussants and a free conversation to follow. The presentation and discussion will run between 15:00 and 18:30. All are welcome. The location is Tampereen yliopisto (University of Tampere), Kalevantie 4, 33014 Tampereen yliopisto Tampere, Finland. 3. 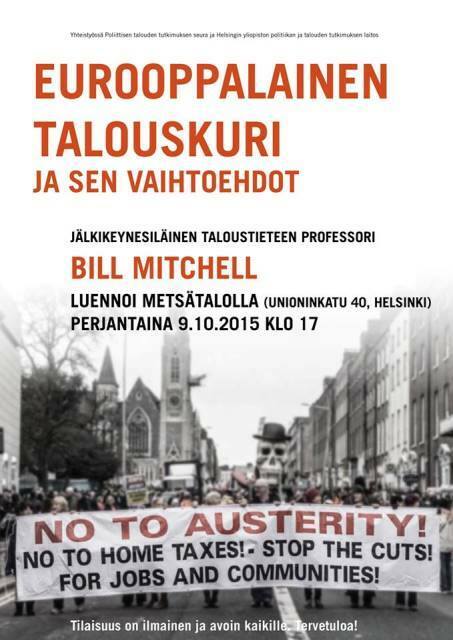 Friday, October 9, 2015 – Guest Lecture at University of Helsinki – Economic Austerity and the Alternatives. The Topic will be similar to the discussion at the University of Tampere although I will branch out and discuss Modern Monetary Theory (MMT) undoubtedly. There will be two discussants and an open discussion to follow. The event is free and open for everyone. It is organized by the Finnish Society for Political Economy and the Department of politics and economics, University of Helsinki. The Finnish Karl Marx Society has promised to organise a good quality video broadcast from the event which will be available on YouTube soon afterwards. The event will run from 17:00. The location is Unionikatu 40, 00170 Helsinki, Finland. On October 21, 2015, I am a keynote speaker at the Poverty and Inequality Forum being held at the Newcastle City Hall and organised by NOVA. More details to follow. If Tsipras can do anything it is make sure that the ‘go to prison for tax evasion’ has some teeth in Greece. If he can get the government machine to work properly and ensure that tax evaders are brought to justice and jailed for a long time then he may have done a service to Greece – even while under the Yoke of the Troika. Of course if at the same time he’s sold off the state assets and signed up to TTIP and TISA then there may be no way back. Thank you for explaining this. You should read what the supposedly progressive (but in reality rabidly Neoliberal) El País newspaper is saying about Tsipras. He has now become their darling. Democracy died long ago. What made you think it was a good thing anyway? When he says he is angry, it’s easy to agree! Sorry to go a bit off topic. Just finished MMT primer and am an enthusiastic reader of this blog. Im trying to get my head around the statement about govt spending preceding taxes. In the private sector, I receive my income every month – in private bank IOUs. A portion of this is taxed and ‘credits’ the government account. One could argue that this is bank created money (not government money) preceding tax? my understanding is that reserves are created/borrowed for net settlement between commercial banks and due to the structure of our banking system there are far fewer reserves than bank created money. Or is it the case then when it comes to taxation, for each £ of bank created money paid in tax, a £ of reserve (HPM) has to be created? Tony Benn an inspiration for Mr Corbyn was always anti EU membership . other ‘leftists’ that the EU was in some regulatory respects a force for good. very much a bad king! it did apparently offer the Greek negotiating team a Euro exit. vacuous idealism is when the right can embrace and champion an empty form of these ideals. neoliberals/cons have embraced as their own. has led them to support all kinds of tyrants and would be tyrants. I say it again – Land Value Tax. If you don’t pay you lose the title deed. The state can sell the house without even knowing who lives in it! But they won’t do it obviously. Tspiras is a shill. Scott, No real money exists prior to government spending or a transfer. That type of transaction is referred to as a vertical transaction in MMT (think of it as a divine goose laying the golden eggs (hpm)). That money is then distributed horizontally from it’s recipients to everyone else in the economy without exception. When the commercial banks you and I deal with lend money it’s actually just credit (lpm) which must be repaid with money obtained from the few recipients of the golden eggs through purely horizontal transactions. It’s possible that your employer is a direct recipient of the golden eggs but more likely gets either credit money from the banks or through horizontal transactions (sales of goods/services etc) with the direct recipients of the golden eggs. Scott, one more point I didn’t cover above is what makes the money in the vertical transactions high powered money (golden rather than just ordinary (commercial bank )eggs). HPM is the kind the government takes out of the economy (there is an upward vertical flow a well as a downward one) when you pay taxes, fees or fines to the government. In this way the government can control the amount of real HPM money floating around in the economy and that allows it to regulate the value of money in relation to real goods and services, ie control inflation, through fiscal and monetary policy settings. It’s a pretty frightful thing when so called democratic governments worldwide completely lose their connection with the true (not the kind being implanted by special interest advertising ) needs, thoughts, feelings and wishes of their citizens. Voter apathy is a direct result of lost confidence in the democratic process ability to produce effectual leadership. Real equity like democracy died about 500 ~ years ago in Europe. Finance capitalism and democracy simply do not mix as capitalism is merely hidden slavery. They give the bums ballot box democracy to preserve the illusion of freedom. We should at least be glad that the magic trick is so obvious now. The first step is to identify the problem after all. The Europeans,and that includes the British,left,right and center,need to grow a spine and some muscle to go with it. Until then,let them eat cake. If anything, Bill is too kind to Tsipras. At first, I called him a Lord Jim, a well-meaning kid who listened to evil counselors & snatched defeat out of the jaws of victory. But “For mine own good, All causes shall give way. I am in blood stepped in so far that should I wade no more, Returning were as tedious as go o’er,” seems to have become his motto. He resigned and called the elections earlier than anticipated, intentionally before the real destructive effects of the 3rd memorandum, his folly, would happen, and before the opposition could (Popular Unity) could organize. Incidentally, Popular Unity is not exactly a breakaway – they only broke away after they were informed that they would not be on Syriza’s list, not be eligible for election under Syriza’s banner. National elections have become a sop, a pretense. And the people knew it and stayed away in droves. One can understand this as an emotional reaction, but never a rational choice. That’s one way the plutocracy wins. If voting was meaningless, why do they always work so hard to keep people from voting? The main problem, as always, but terribly saliently here, is lack of the only good, according to the greatest Greek – Knowledge. The problem is people really do believe ludicrous lies. Otherwise sane people think that Greece would have a famine after Grexit! Really, I think that the most powerful weapon, that nothing can stand against (according to Mark Twain – one last pretentious literary allusion :-) ) is needed to dispel these joke-beliefs – Laughter. Read CH Douglas views on land tax and come back to me. The reductionist position is that the socialists have shown their true colours. They do not believe in localism. The fairy tale is over folks. Reality has arrived for nice but naive socialists. Not for the first time either I might add. I noticed that Australia’s new Treasurer, Scott Morrison, has proclaimed that we have a spending problem. Well, yes, we do have a spending problem .. there’s not enough spending!! But somehow, I suspect this is not what he meant. What Morrison has clearly signaled is that there will be no change of direction under Turnbull-Morrison from the economic trajectory established by Abbott-Hockey. That is, the mindset and intention to perpetuate a regime of austerity has not changed. Prime Minister Turnbull will eventually learn, to his political cost – and especially if Australia moves into a prolonged recession – that it was an error of judgement (grounded in ignorance) to appoint a cowboy and economic illiterate to the position of Treasurer. Bob, watching the Canadian election campaign unfold is just sickening isn’t it? None of the parties are interested in following anything outside the box. Even the Liberals who claim they will run a deficit for the next three years think they will need to tax someone to “pay for it” eventually. This rather than owning up to past mistakes based on that thinking and telling us we’re moving beyond the Chicago school thinking and restoring Canada to it’s former progressive path. Mainstream media, the CBC even, talk about “filling the coffers” presumably for the wellbeing of future generations all the time, and the current finance minister who is in denial about recession can’t manage to let a word out of his mouth if it doesn’t sound neo-liberal. He( Joe Oliver) and Prime Minister Harper both argue that while the oil sector is in a recession that is beyond their control, an externality, the other 80% of the economy is doing fine; so looks like we’re all good. No blame is accepted for the heavy gearing of the entire economy to support of the Tar sands enterprise, a very price sensitive export commodity, in the first place. The Conservatives are continuing to play the strong man role and have convinced many that free market fundamentalism is the only way and not even democracy will stop them from doing everything possible to make it so. John, I don’t believe the government has made any error in judgement with respect to its fiscal policy. I don’t believe balancing the budget is the goal, but rather taking the opportunity to seize the welfare state through implementation of austerity. They can do it because the household/government budget analogy has been inculcated into the wider population. I believe there is a TYPO; a NOT has been omitted in the last sentence below. Thanks for picking up the typo – it was a rather important one.